560 Mb - 1019 dwg files classified under 110 folders. 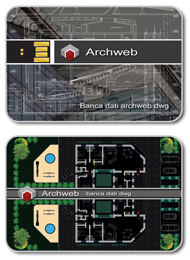 The archweb dwg database contains a wide range of complete projects. Boost your productivity. As the figures themselves show, the database is enormous, complete with every category you might need to prepare a professional architectural project, and full of details and project outlines that will help you take your projects to a whole new quality level. The Flash Drive categories are classified using the same structures employed in the dwg section of the website. There are 20 times the number of drawings (6.2 Gb) than there are on the website (200 Mb). 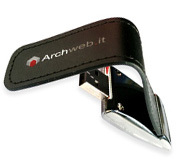 Famous architecture is not included on the USB Flash Drive. Our Textures database has been designed specifically for architectural rendering. As such, it contains materials that are commonly used in architectural projects. Their application can be seen on the rendering page. In particular, use the free download section to assess a selection of textures. The database contains 19700 Textures classified into 220 folders for a total of 4.3 Gb. A wide array of choices available, providing a great variety of texture sizes and formats. Our prices are highly advantageous. Given the magnitude and quality of our database, you would be hard pressed to find a better offer. The database will be sent the day after payment is confirmed. Pay via PayPal - a quick, free, and secure system - using your credit card or prepaid card. Enjoy maximum protection for your online transactions with PayPal.